Feral House has been open to publishing unorthodox–some say wacky–“conspiracy theories.” Initially, it didn’t matter so much whether these ideas were always “truth” as much as their ways of stimulating thought and imagination by presenting different perspectives of how the world worked. 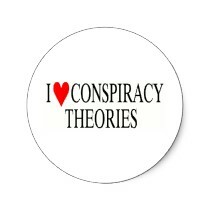 I Heart Conspiracy Theory because it opens the mind from the usual propaganda of flag-waving, apple pie and Chevrolets that cloud the mind and cover up the criminal routine. Today, Conspiracy theories no longer are suppressed or underground. They’ve totally lost their innocence and have largely become a means for wealthy plutocrats to lead stadiums of the closed-mnded to point fingers, fart, howl, and blame. That said, we must not forget that there are still people who uncover funny business, and for whom making money is not the motivator. For the past couple months I’ve been working on a screenplay about the cover-up of the JFK assassination, and been brushing up on my knowledge of this story. It sickens me to see a book like Vince Bugliosi’s Reclaiming History, which is a couple thousand pages of nothing but lies, misdirection and ridicule. For this tome, Bugliosi received a million dollars of advance money from the New York publisher Norton. I hope that Norton at least received intelligence payments to cover their huge losses on publishing this dismal-selling tome. And now it’s being made into a television series by none other than Tom Hanks and friends. You gotta wonder what the motivation might be. For a refreshing zing of truth, have a look at Jim DiEugenio and Lisa Pease’s The Assassinations, now back in print through Kindle, and soon enough through print on demand.